A Quiet Place starts off with a hush. There are people walking through an abandoned supermarket and they are obviously desperate to make no sound. They’re barefoot, they speak with hand motions and they walk quietly, not touching anything that could make a noise. These people are members of the Abbott family — Lee (John Krasinski), his wife Evelyn (Emily Blunt) and their three children — one of whom is deaf, which is why they already knew sign language when an alien invasion took place 89 days earlier. It appears the creatures are blind, but have very sensitive ears. It’s how they know to attack and as long as the family doesn’t make any sound, they’ll be safe. Or so they hope. From the moment the film begins, a hush falls over the audience. Although there is some dialogue, it’s minimal and only at opportune times so as not to attract a creature. For 90 minutes, the audience is so entranced that they forget to — or are reluctant to — eat their popcorn or wrapped candy for fear they’ll break the silence. Although the threat of danger and the possibility of swift death is very real, there’s a sense of peace as you watch the film, similar to how a room gets quiet when everyone is focused on a common goal. When we see the world through the deaf daughter Rachel’s eyes, the lack of sound is surprising. Even though the Abbott family’s world is soundless to our ears, when we are given Rachel’s perspective, that’s when we realize what it’s like to have completely no sound at all. It puts her in greater danger, because when there is sound, she’s not aware of it. The movie has incredibly high stakes, because in addition to everything else, Evelyn is expecting and it makes you wonder — how is she going to deliver a baby with no sound? How will they keep the baby quiet after being born? Will the arrival of the baby mean the end of the Abbotts? It’s a fascinating premise and a moviegoing adventure like nothing you’ve ever before experienced. 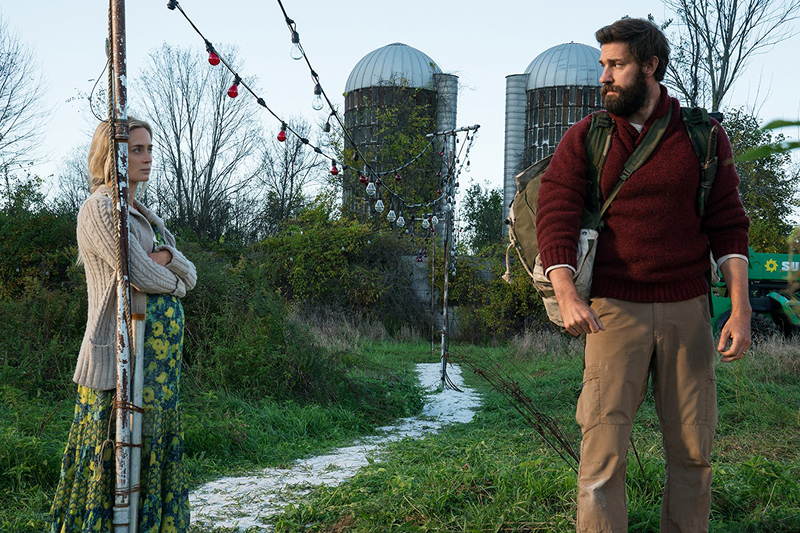 John Krasinski’s direction is excellent — instilling in us a sense of fear that compels the audience to keep as quiet as possible. The acting from the cast is spot on, with each family member on tenterhooks as they go through their day, focusing on not attracting the creatures to their farmhouse, while Lee desperately tries to find contact with others through a radio set, hoping that there are people somewhere who could possibly help them or offer advice on how to combat the creatures. If you have seen A Quiet Place and would like to rate/review it yourself, click here. To watch our interview with John Krasinski, click here. I had no idea what it was about…now I’m interested! Looks really good 👍 I cant wait to see this . Great review, definitely will have to see this! I like John Krasinski and Emily Blunt, but I got absolutely no sense of chemistry from the two of them in this movie (despite the fact that they are married in real life). It also left me asking so many questions SPOILER ALERT if they can be killed with a gun, why didn;t the army/police/gun owners eliminate them? Why didn;t the family live or camp near the waterfall so they would not have to live in such silence? If they are so sensitive to sound, why did they not use sirens to weaken them and then kill them? Fire make noise, why didn;t the creatures come after them when they started them? How did the father build a wooden box in silence for the upcoming baby? How did the creatures get there in the first place? I thought this movie sounded like a very interesting concept and a very original idea and it was, but the movie needed more help with this. Oh this movie scared me out. Very good movie. Sounds like a great movie, this is a well-written review when it makes me want to see the film.